Katherine Sophie Dreier (American, 1877–1952), Landscape with Figures in Woods, ca. 1911–12. Oil on canvas, 27 ¼ x 19 in. (69.2 x 48.3 cm). George Walter Vincent Smith Art Museum, Springfield, Massachusetts, Gift from the Artist’s Estate. Like The Blue Bowl, Dreier’s other contribution to the Armory Show, the style of The Avenue, Holland is unexpected from one who became such an avid collector and dedicated proponent of more avant-garde art in later years. 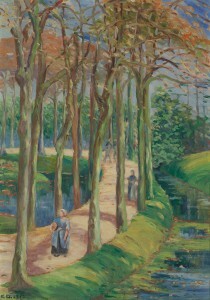 The subject may reflect Dreier’s early academic training in New York beginning in 1904 and in Paris from 1907, where she exhibited at the Salon des Beaux Arts in 1911, while the impressionistic style demonstrates a tentative exploration of more current trends. The painting was offered for sale at both the Armory Show and Macbeth Gallery, but did not sell. It remained in the artist’s collection and was given to the George Walter Vincent Smith Art Museum in 1953 by her estate. In the years following the Armory Show, Dreier’s style developed along with her dedication to the Modernist movement. She began creating accomplished avant-garde paintings such as Abstract Portrait of Marcel Duchamp (1918, Museum of Modern Art, New York) and Two Worlds (Zwei Welten) (1930, Yale University Art Gallery, New Haven, Connecticut) that show the influence of Marcel Duchamp, whose work she surely encountered at the Armory Show and whom she befriended through the Society of Independent Artists in New York in 1916-1917. In 1920 Dreier and Duchamp, together with Man Ray, founded the Société Anonyme, an art organization that sponsored lectures, concerts, publications, and exhibitions of modern art between 1920 and 1940. The exhibition ran from October 14-27. See Exhibition of Paintings by Katherine S. Dreier, exh. cat. (New York: The Macbeth Gallery, 1913). See “Miss Katherine Dreier to Hold an Exhibition,” Brooklyn Life 48, no. 1231 (October 4, 1913), p. 19. “Katherine Dreier’s Work,” Brooklyn Daily Eagle, October 13, 1913, p. 5. “Paintings by Katherine S. Dreier,” New York Times, October 19, 1913, SM15. As an artist, patron, and museum director, Katherine Dreier was an influential promoter of Modernism in the United States. Born to a wealthy New York family, Dreier first studied painting under Walter Shirlaw at the Art Students League in 1904. Between 1907 and 1914, Dreier spent much of her time abroad, traveling, studying art, and exhibiting her work in one-artist shows. At the Armory Show Dreier exhibited two of her own paintings, Blue Bowl and The Avenue, Holland, and purchased lithographs by Paul Gauguin and Odilon Redon. She also lent a small painting by Vincent van Gogh, Head and Shoulders of a Young Woman (now Mlle. Ravoux), which she had purchased at the Sonderbund Exhibition in Cologne, Germany, in 1912. It was the first painting by Van Gogh ever purchased by an American. Dreier amplified her role as an advocate for avant-garde art in the years following the Armory Show. Later in 1913 she founded the Cooperative Mural Workshops, a short-lived art school and studio space that focused on mural painting, stained glass, woodcarving, and polychrome sculpture. In 1916 she served on the board of directors of the Society of Independent Artists and helped organize and finance their major exhibition at Grand Central Palace in New York in April-May 1917. Though the Société’s influence waned during the 1930s, both its and Dreier’s own holdings of modern art continued to grow until she bequeathed the group’s collection to Yale University in 1941. Dreier and Duchamp dissolved the organization in 1950, shortly before Dreier’s death in 1952. Duchamp was responsible for distributing her personal collection, sending nearly 300 works to Yale and others to the Philadelphia Museum of Art, the Museum of Modern Art, the Guggenheim Museum, and the Phillips Collection in Washington, D.C. Her partners in the endeavor were William Lauren Harris, Arthur Crisp, and Ida Proper. See “Miss Dreier Behind a New Art Departure,” Brooklyn Life 48, no. 1235 (November 1, 1913), 13.